CHOICE+ is a training program that aims to improve the mealtime experience for residents in long-term care. It focuses on developing relationship-centred practices and enhancing the dining environment to make mealtimes feel like home. CHOICE+ is a training program designed to support relationship-centred dining in long-term care and improve the mealtime experience. Each letter of the “CHOICE” acronym is a core principle of relationship-centred dining: Connecting; Honouring dignity; Offering support; Identity; Creating opportunities; and Enjoyment. The objective of CHOICE+ is to create mealtimes that feel like home, where personal preferences are honoured and dignity is supported. The CHOICE+ program was piloted in two long-term cares homes over 16 weeks. 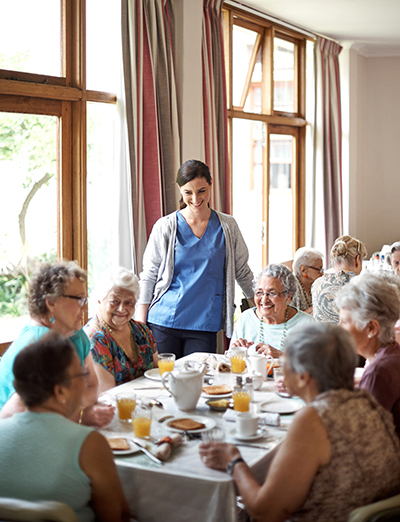 The research team observed mealtimes to see if there were any changes in team member relationship-centred care practices and resident-focused social interactions at mealtimes. Several aspects of the dining experience (for example, resident-centred care processes, physical environment, overall mealtime ambiance) showed improvement over time. The results of this project helped to determine the benefits of the program, and informed how the program could be improved.